WITH EVER-TOUGHER EU regulations driving the need to reduce engine emissions, there's no doubt that technology will be utilised to produce smaller capacity units and lighter vehicles. Fortunately, modern technology doesn't always mean we have to lose out on motoring enjoyment. To prove the point about smaller and consequently lighter weight engines, the new Fiat two-cylinder TwinAir petrol engine has a cubic capacity of just 875cc  but with a turbocharger added, the power output is a healthy 85bhp. But even more significant is the fact that the turbocharger is specifically designed to boost torque and not just outright power. This means that this vertical-twin unit generates a healthy 106lb ft of torque at 1,900rpm. The engine also has the lowest CO2 emissions of any production petrol engine in the world: just 92g/km. Fuel consumption is equally impressive with a Combined Cycle fuel consumption of 70.6mpg for the semi-auto transmission model or 95g/km and 68.9mpg for the five-speed manual versions. Now none of this means anything if the engine is so slow it makes the car a liability. But with the installation in the Fiat 500 Hatch (and 500C cabriolet) top speed is 108mph and zero to 62mph takes just 11 seconds. Remarkably, this is better than many 1.0, 1.2 and 1.4-litre four-cylinder petrol engines. Again it means little for customers if technology comes at a price which is too expensive to buy or run reliably. In the case of the TwinAir, road tax is nil; for Londoners the Congestion Charge does not apply (from January 2011); and prices start at �10,665 for the 500 TwinAir Hatch and �13,665 for the TwinAir 500C. 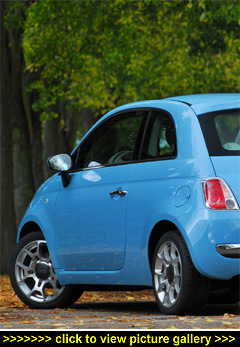 Fiat UK expects to sell around 4,000 TwinAir 500 models  85 per cent of them three-door Hatch versions. Trim levels are Pop, Sport, Lounge, byDiesel and Blackjack depending on which body style is chosen. TwinAir models cost �1,200 more than the conventional best-selling 1.2-litre four-cylinder petrol engine but are �1,200 cheaper than the 1.3-litre MultiJet diesel. Plus the TwinAir is cleaner in terms of CO2 emissions than both of them. It is more powerful, with better performance, than the 1.2-litre petrol model and only a little short of the MultiJet diesel unit for fuel economy and performance. Buyers will need to do their sums if considering the TwinAir option but many customers will buy it because it is unique in character. Twin-cylinder petrol engines are nothing new in the car industry  the original Fiat 500, the Citroen 2CV (from 1947 to 1982), Citroen LNA in the 1980's and the NSU Prinz 4 of the 1960's all had them. And Jowett cars and Bradford vans and Utility estates from before the First World War until well after the Second World War also used twin-cylinder petrol power. Back then, the common feature was dull performance although with a distinctive engine note. The engine note, to some extent with the TwinAir, is still there but this engine is far more 'rev-happy' with much more power and, importantly, it is the turbo-torque that really works. The revs happen very quickly and it is easy to hit the rev-limiter in first gear on acceleration from standstill. The note of the engine sounds lazy so the natural inclination is to push the accelerator more and that really sends the revs spinning. Indeed, the oddest characteristic of the TwinAir is how the sound bears no relation to the actual performance. It might sound as though it is labouring but in fact, boosted by the turbo, the engine has everything in hand  as proved by the gearchange indicator light telling the driver to change to a higher gear even if it feels a lower gear is still required. With just two cylinders, engine braking is almost nonexistent. However, the standard-fit Start&Stop system seems to work equally well with this two-cylinder unit as it does with a four-pot. There is also an Eco button that selects a softer throttle setting and lightens the steering for in-town driving; on semi-auto transmission models it alters the gear shift patterns. To be honest, my driving colleague and I found the engine nicer to drive in the Eco setting, even on country roads. To prove the point, in standard mode our manual gearbox Hatch recorded 46mpg and then 48mpg in the Eco mode. Interestingly, a same-spec model driven solo by one of our colleagues ahead of us at the same speed for the town and country test route returned 60mpg, so carrying more weight with two-up notably reduced the fuel saving potential. Reasons to welcome the Brave (if drastically downsized) New World: Lowest CO2 emissions for any petrol engine, cheap to run, technically interesting engine in a desirable city car  a good combination for some. Reasons not to: High price over a conventional small four-cylinder petrol unit, noisy at mid-range speeds and above and little engine braking.